As the Olympics were kicking off, the Brazilian Bovespa scored a key breakout; with the Games wrapped up, the index is testing that breakout point. “Test Week” continues today with a look at a country that has been in the global spotlight lately, though not because of its stock market. Brazil has been the center of attention recently, having just wrapped up hosting duties for the Olympics. However, its stock market has also been a very intriguing one to us. And it is presently in a very interesting spot again. For, just as we have noted this week with Germany and REITs, the Brazilian Bovespa is testing a very important level right now. 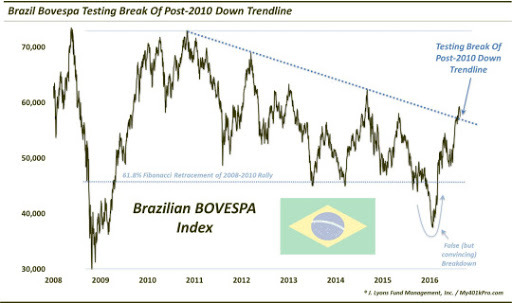 In mid-July, the Bovespa was on a tear, having just broken above a 2-year Down trendline. With the Olympics approaching, the index had climbed some 34% just since the post-Brexit lows at the end of June. In a post on July 19, however, we noted that the Bovespa was running into a serious potential obstacle in the form of a 6-year Down trendline, stemming from the 2010 highs. After consolidating just below the trendline for about 2 weeks, the Bovespa broke above it in early August – on the day before the Olympic opening ceremony. The index would proceed to follow through on the breakout as the 2-week event unfolded, tacking on another 4% or so. As the games drew to a close, though, the rally petered out. And on Monday, the day after the closing ceremonies, the Bovespa dropped more than 2%. And today, it found itself in the vicinity of its trendline breakout of a couple weeks ago. Now, we don’t know if the coinciding Olympic Games had anything to do with the performance of Brazilian stocks over the past month. And we don’t care. All we care about is what is happening in the markets. And this test, as the chart indicates, could be a very important event for the Bovespa in determining its fate in the near to intermediate-term future. Like the past few posts, the takeaway is straightforward. If the Bovespa is able to maintain its ground above the 6-year trendline, then the benefit of the doubt goes to the bulls. If, however, prices break back down through the trendline, then a major failed breakout could be at hand. That could lead to significant potential downside in the near-term. And while it pays only to watch the reaction of prices around this level, one factor that leaves us skeptical about the index’s ability to hold the trendline is the nature of its breakout in the first place. As we have said many times, when the breakout of a significant level is being threatened, we prefer to see a deliberate approach by prices, initially. That is, we like to see prices consolidate below the significant level for some time prior to attempting a breakout. The more times that prices can bump up against the level, the more it can whittle away at its resistance. Thus, a breakout after an extended consolidation typically stands a better chance of maintaining its breakout and of exhibiting meaningful follow through. In the case of the Bovespa, the 2-week consolidation below a 6-year trendline doesn’t really instill much confidence in its potential to maintain the breakout. Yes, only the price action will tell us if the breakout will be successful or not. However, analyzing the character of the breakout can be useful in determining the odds. And in this case, we have serious reservations about Brazil’s chances of successfully and permanently clearing this hurdle, at least for now.